Use the BMP matrix to identify, prioritize, and implement BMPs throughout the watershed to reduce sediment and phosphorus runoff from existing shoreland development and roads. Educate landowners through BMP demonstration sites, workshops, and other communication strategies, targeting high priority septic systems (>20 years old, within 50 feet of a waterbody, and rarely pumped out). Institute greater controls on new and re-development, require low-impact development (LID) in site plans, and encourage regular septic system maintenance. Continue to protect and conserve high value plant and animal habitat, wetlands, and riparian areas through preservation, conservation, and restoration efforts. Continue and/or expand the water quality monitoring and aquatic invasive plant control programs. Although both lakes are currently below NHDES thresholds for median in-lake total phosphorus (TP) concentrations in oligotrophic (Lake Waukewan) and mesotrophic (Lake Winona) lakes, these target TP reductions will help safeguard these lakes against impacts from future development and land use change in the watershed. These objectives and more are discussed in greater detail in the Action Plan. Achieving the goals and objectives for future implementation work in the Lake Waukewan/Winona watershed will require a comprehensive and integrated set of activities as identified below. Address the top priority sites for both Lake Waukewan and Lake Winona, with an emphasis on cost-efficient fixes that have the lowest cost per kg of phosphorus treated, weighted by impact score. Priority rankings were based on field observations and model estimates. Local stakeholders reviewed the prioritized sites to determine the most appropriate sites for BMP implementation. Many other factors not considered in these rankings may change the order of prioritized sites, including landowner cooperation, funding availability, visibility, etc. Conceptual designs and cost estimates were generated for two sites; one each in the list of top six sites identified in the Lake Waukewan and Lake Winona watersheds; Site 1-08A at the Waukewan Bath house, Meredith, and Site 2-12A/B site at the Lake Winona boat launch. Work with landowners to get commitments for treating and maintaining sites. Workshops and tours of demonstration sites can help encourage landowners to use BMPs on their own property. Measure the pollutant load reduction for each BMP installed. 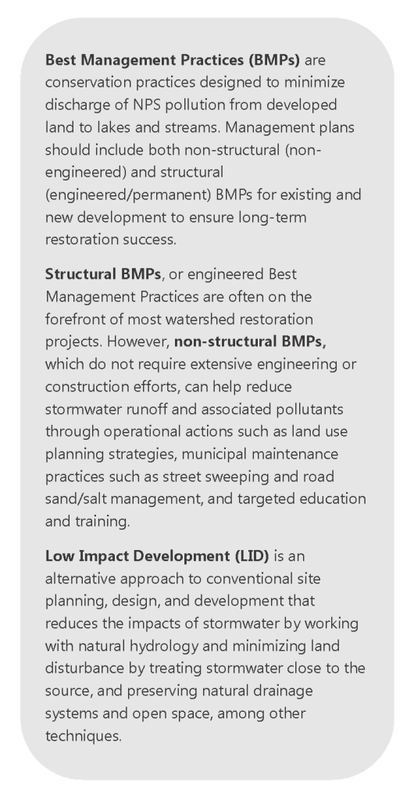 These basic methods help guide the process and prioritization of BMP implementation in the watershed. Refer to the Action Plan and conservation practice fact sheets provided by the Cumberland County Soil & Water District (http://www.cumberlandswcd.org/ta/index.htm) for a continued discussion of BMP implementation strategies. The top 6 priority sites for Lake Waukewan will reduce the watershed TP load by an estimated 33.4 kg TP/year, or 108% of the total needed to reach the goal of 276 kg TP/year. Approximately $25,000 would need to be raised to successfully implement and maintain these BMPs over the next 10 years (Table 23). The top 6 priority BMP sites identified around Lake Winona will reduce the watershed TP load by an estimated 51 kg TP/year, or more than 500% of the total needed to reach the goal of 93-98 kg TP/year. This would cost roughly $49,000 over the course of 10 years. These estimates are based on the Region 5 model for estimating pollutant load reductions. Properties with no buffer (scored 5) have 100 ft shorelines contributing 2 kg TP/yr each and would each cost about $3,000 to revegetate and mulch with volunteer labor. Revegetating impacted shoreline along Lake Waukewan would cost about $60,000 to implement and reduce TP by 80 kg/year. Only one property along Lake Winona was observed to have no buffer, so buffer plantings would cost about $3,000 to implement and reduce TP by 2 kg/year. Summary of cost estimates and total phosphorus (TP) reductions for sites identified by the shoreline survey as needing buffer plantings. All together, these BMPs would greatly reduce TP loading to Lake Waukewan and Lake Winona, well beyond the TP reduction goals set by the Waukewan/Winona Lake Study Advisory Committee. The TP reductions for Lake Waukewan may be even greater if BMPs are implemented at Lake Winona, since this waterbody feeds into Lake Waukewan. Implementing these suggested BMPs at Lake Waukewan and Lake Winona would cost roughly $137,000 and would address more than 100% of the 5 or 10% (31 and 5-10 kg TP/year) needed in TP reduction for both Lake Waukewan and Lake Winona, respectively. Summary of total phosphorus (TP) reductions and estimated costs of priority BMP implementations at Lake Waukewan and Lake Winona. Without a monitoring program in place to determine these pollutant levels, it will be difficult to track successful reduction efforts. However, there are various spreadsheet models available that can estimate reductions in these pollutants, depending on the types of BMPs installed. These reductions can be input to the LLRM model developed for this project to estimate the response of the lakes to the reductions. Non-structural watershed restoration practices prevent or reduce stormwater related runoff problems by reducing the exposure and generation of pollutants and providing a regulatory framework that minimizes impervious cover. Non-structural approaches to watershed restoration can be the most cost-effective and holistic practices within a watershed management framework. The non-structural approaches recommended in this plan can not only improve water quality, but can also enhance watershed aesthetics (e.g. through shade tree planting, landscaping, and trash reduction), streamline the permitting process (e.g. by removing conflicting design or stormwater codes), and reduce development costs (e.g. by minimizing impervious area development). Good housekeeping measures and education/training to promote awareness regarding the first component. Review current zoning ordinances for regulatory barriers and improvements. Take additional measures to reduce impervious cover. Promote the use of specific LID designs. Use overlay districts to add new requirements to existing zoning districts. Establish standards or incentives to improve stormwater management in developed areas. Address storage/use of pollutants that contact stormwater. Maintaining an Organizational Structure for Implementation. Since the watershed spans multiple municipalities, a cooperating group, representing the towns, association, and other local watershed groups, should be established for the implementation of future efforts in the watershed. This will help coordinate the implementation of restoration activities. In addition to state and municipal officials and watershed groups, this collaborative approach should involve the various commercial business interests in the watershed to allow for a full consideration of all issues relevant to an effective, efficient, and cost-effective restoration program. Establishing a Funding Mechanism. A long-term funding mechanism should be established to provide financial resources for restoration actions. In addition to construction and organizational management costs, consideration should also be given to the type and extent of technical assistance needed to design, inspect, and maintain stormwater BMPs. Technical assistance costs for the annual field monitoring program should also be considered. 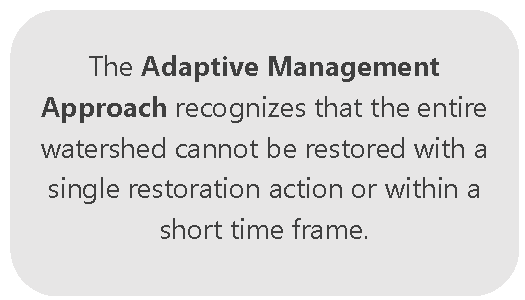 Funding is a critical element of sustaining the restoration process, and, once it is established, the management plan can be fully vetted and restoration activities can move forward. Synthesizing Restoration Actions. This watershed management plan provides prioritized recommendations to support restoration (e.g., structural/nonstructural recommendations for priority areas). These recommendations, or action items, need to be revisited and synthesized to create a unified watershed restoration strategy. Once a funding mechanism is established, the lake watershed restoration program should begin in earnest by developing detailed designs for priority restoration activities on a project-area basis and scheduling their implementation accordingly. Continuing the Community Participation Process. The development of the Lake Waukewan and Lake Winona Watershed Restoration Plan has greatly benefited from the active involvement of an engaged group of watershed stakeholders with a diversity of skills and interests. Plan implementation will require their continued and ongoing participation as well as additional community outreach efforts to involve even more stakeholders throughout the watershed. A sustained public awareness and outreach campaign is essential to secure the long-term community support that will be necessary to successfully implement this project. Developing a Long-Term Monitoring Program. Although current monitoring efforts are strong, a detailed monitoring program (including ongoing monitoring of watershed tributaries) is necessary to track the health of the lakes. Indeed, the overall goal of the watershed management planning process is the improvement of water quality and long-term health of these lakes. Refer to Monitoring section of the Action Plan. Establishing Measurable Milestones. 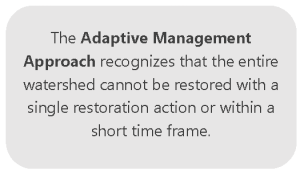 A restoration schedule that includes milestones for measuring the restoration actions and monitoring activities in the watershed is critically important to the success of the plan. In addition to monitoring, several environmental, social, and programmatic indicators have been identified to measure the progress of the Lake Waukewan and Lake Winona Watershed Management Plan. These indicators are listed in the Plan Implementation section and are intricately tied to the action items identified in the Action Plan.